Read from May 07 to 26, 2015. I’m not sure how to classify this book. 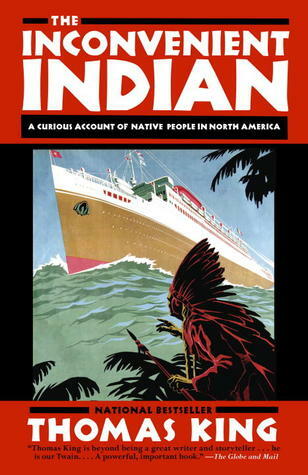 I guess it’s a history book of the Indians of North American that also discusses their past and current social and cultural issues. The difference being the style of writing that King has chosen to portray this information. King writes this book like he is having a conversation with you, literally. He even adds tidbits of what his wife Helen would have suggested for certain portions of the book. It’s a bit jarring at first but once you warm up to the style it actually makes for a pleasurable and potent read on some very relevant and important topics. This was the last book out of the five that I’ve read for Canada Reads 2015, I will make a post discussing all five of the books next week. As a white person, I feel that this is a very important book. Growing up in Canada you get your fair share of Native American history throughout your schooling, however I can tell you now after reading this book that the history comes from a very biased, and white, perspective. The history taught in Canadian schools doesn’t touch the half of what has really occurred to the Natives in this country. This book is important because King gives a voice to the hushed Native Americans of North America and lays out exactly why the ‘Indian problem’ is still very relevant in today’s society. I think that many non- Natives don’t understand complexity of Native history and why some reservations today are often times filled with Natives that cannot ‘integrate’ into society. King does a phenomenal job of laying out the neutral facts and realities that face may Natives today by detailing their histories that brought them to this point, and why some of the long standing issues that they have to deal with are still not solved. King’s neutral and relatively pleasant style of writing allows to the reader to approach the content without getting defensive, for both Natives and non-Natives. In terms of Canada Reads, I can see why this book was cut first. In comparison to the other books, this one just didn’t hit the theme as much, which is books that break boundaries. Don’t get me wrong this book does break boundaries with it’s writing style and by discussing the Native issues that many try to ignore but in comparison to the other books in the challenge, this one wasn’t as strong. Just based on King’s writing style in this book, I am interested to read more by him. He is a captivating writer and I imagine his fiction would be quite good. Overall, I think that any non-Native person born in North America would benefit from reading this book in order to get a greater understanding and appreciation for the groups of people that were here long before us. Read from February 07 to 16, 2015. I picked up this gem while I was actually in Cuba back in January of this year. It was my first trip to Cuba and I realized how little I knew about this fascinating little country with its big and expansive history. Thankfully there wasn’t a shortage of propaganda where I was staying. If I had more money and space in my suitcase I would have purchased quite a few more books. Che is a remarkable individual and his dedication to Cuba and to the cause of communism is almost next to nothing. Che comes across as extremely intelligent and very articulate. His memoirs and diaries are published everywhere which probably makes him one of the most exposed politicians around. Don’t get me wrong, the Cuban government is pretty good at giving the leaders of their communist revolution a great reputation, and they have to. The history of Cuba is a rocky one, so the insurgence of this particular revolution was necessary for its time. From the Spanish to the British, and then the US, someone else was always taking advantage of Cuba and its people suffered for it. In 1933, Sergeant Fulgencio Batista threw a coup to overthrow Gerado Machado, a Cuban dictator known for his vicious rule. Sadly, after this coup, little changed under Batista’s rule. It was in 1953 when Fidel Castro made his first attempt to revolt against Batista’s regime. It would be after this attack that a young Argentinian doctor named Ernesto Guevara would join the cause and assist in Cuba’s revolution and liberation. “Che” is a form of colloquial Argentinian Spanish slang used in a vocative sense as “friend”. Che is the famous nickname given to Ernesto as a joke and term of endearment based on his heritage from his fellow Cuban comrades. 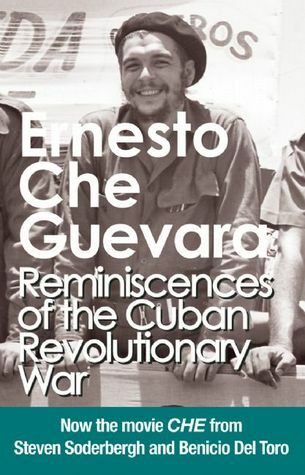 This book is a personal description of Che’s experiences during this pivotal revolution. Che spares no details with how difficult it was living in the forest for months at time and the sad deaths and sacrifices endured by all, especially the peasants of Cuba, who were initially afraid to assist or join the cause. His recollection is impressive as he remembers many of the names of some of the small time peasants who were essential in helping with the revolution that might have other wise been forgotten. He also details the specifics of those who betrayed the cause. Some he speaks of with remorse or honor and others with absolute distaste and resentment. It was exciting to see how big the small group of rebels became over such a short period of time . In 1959 the rebels send a group of 9000 strong into Havana, forcing Batista to flee, starting the beginning of a new era for Cuba, one that would bring positive change to the country and the lives of its people for the better. From my own impressions of Cuba, some aspects of communism are no longer serving its people. Don’t read me wrong, I’m not saying that they need to replace their system with American capitalism but there are definitely areas that need improvement. The locals don’t have immediate access to some of the best food or clothes because they are too expensive and some people are still not allowed to leave specific regions of Cuba. Tourists get the best of everything, while they don’t. I was asked twice, discreetly, while I was there if I had any clothes or items that I was willing to part with. It made me pretty sad but if I wasn’t there as a tourist their economy and the people there would have even less. With tensions currently being mended between America and Cuba, as much as I don’t want this quaint country to become Americanized, it will eventually mean improvements for the locals. Overall, a good description of the events and people that changed Cuba to make it the country that it is today.